Every wedding day has a soundtrack of its own—from the walk down the aisle to the first dance, the bouquet toss to your final farewell, music helps set the tone for the entire day ... which is why your DJ has such an important role. We’ll help you plan your reception from start to finish based on YOUR wants, needs and expectations. We will make ourselves available to you throughout your entire planning process. If you have a question, we are easily accessible in person or via phone or email. Pricing is determined by your wants and needs, not ours. Your florist, your baker and your seamstress can't quote you a price until they know what you want and neither do we. 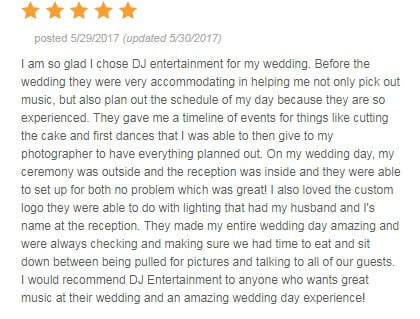 Once we know the expectations for sound equipment, lighting options and the location of your wedding reception, we will provide you with a firm price.